I’ve been reading up on Brazil in advance of my trip, and given how much it has to see and do, I’m lucky to have 23 days there to explore. I will visit Sao Paulo (the country’s largest city), Salvador (the capital of Afro-Brazilian culture), Natal (northeast beach city) Manaus (located in the thick of the Amazon rainforest), the famous Rio de Janeiro, and Foz do Iguassu (home of Iguassu Falls) before returning to Germany. Between lounging on beaches, seeing all of these cities, learning about Brazilian customs and traditions, hiking and hang gliding and other outdoor activities, following the World Cup matches, and dancing the nights away, I have a pretty packed agenda. 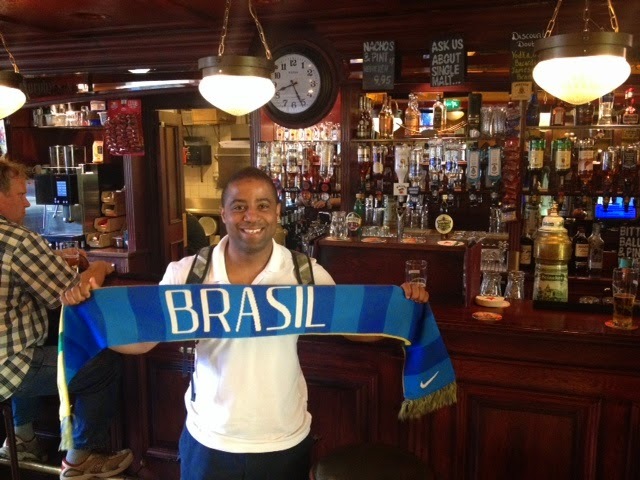 Mostly I am looking forward to immersing myself in the world’s greatest sporting event—as well as meeting people from both Brazil and around the world. Because it is taking place in arguably the most soccer-crazy nation in the world, I expect this World Cup will be epic. It is also being held amid a backdrop of protests and social unrest (that I hope to avoid!) regarding the billions of dollars being spent on the tournament. Can Spain win their 4th major international tournament and cement their status as one of the greatest teams in international soccer history? Will Brazil be able to cope with the massive pressure from the public to win their 6th World Cup on home soil? Who will be the surprise team to make a deep run in this World Cup? Will the USA be able to handle increased expectations and navigate their way through the “Group of Death” to advance in the tournament? As I write this, a day before I leave, it hasn’t really sunk in for me just yet, and it probably won’t until I take off. Nevertheless, I am excited about this trip and even more excited to share it with others!